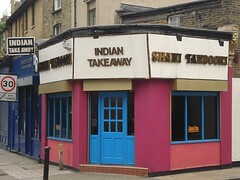 Indian takeaway in Bermondsey, an "X in Y sauce" curryhouse-style place that's been trading since 1989. The menu photo 1, photo 2 is a fairly standard one. They also do delivery, and you can order online via Just Eat. Kake and bob tried the delivery option on a Monday evening in October 2009. The food arrived on time with no problems. Poppadoms, which came free, were a bit greasy in Kake's opinion, though bob thought they were fine. Meat samosas (£1.90 for two) were OK, but the minced meat inside was a bit gristly. Onion bhajis (£1.90 for around four) were fine. King prawn dansak (£7.80) had a good level of chilli heat, but with very little accompanying chilli flavour. A curryhouse dhansak should be hot, sweet, and sour; this had some sweetness but no sourness and no complexity. The king prawns themselves were rather mushy. Sag bhaji (£2.50) and bhindi bhaji (£2.50) were fine without being anything special; pleasingly, although very cheaply priced, they weren't bulked out with onion. Plain rice (£1.90) was also fine without being anything special. Food last sampled by Kake and bob, 19 October 2009. Opening hours taken from the Shahi Tandoori website, October 2009. Last edited 2010-07-15 09:44:34 (version 3; diff). List all versions. Page last edited 2010-07-15 09:44:34 (version 3).